Photonic technologies contribute almost £13 billion to the UK economy. This competition will provide funding to international partnerships to develop new industrial processes. 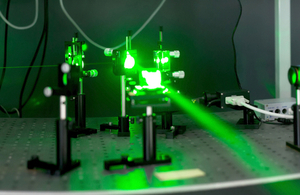 Photonic technologies including lasers and fibre-optics contribute almost £13 billion to the UK economy. These technologies, which generate and harness light, can currently be found in smartphones displays and driverless cars. Light-based technologies also account for 7% of all UK manufacturing output. This means that the UK is currently among the top 10 countries for global market share of photonics components. However, ensuring the UK’s continued success will require continued improvement on products and processes. A share of £2 million is available for international partnerships developing novel industrial photonic technologies. The funding is available through the EUREKA Network in Photonics, a joint initiative between Innovate UK and the Photonics21 Mirror Group. The competition is focused on significantly improving products and processes surrounding photonic technologies. Projects can also partner with other UK-based businesses and research organisations of any size.